I’ve gotten a little flack from various well-known names regarding the comments on my previous post, Doug Phillips Resigns from Office of President at Vision Forum, Discontinues Speaking Engagements. One thought is about how wrong it is to “chortle” over the news of Doug Phillips stepping down as president of Vision Forum Ministries (he did not mention stepping down from the for-profit arm of Vision Forum). I don’t think anyone has been doing any chortling (gotta love that word), but people might be glad that truth is exposed because that is the beginning of healing. But some have been saying people should remain quiet and pray for him and his family as he has shown great humility by his public statement. 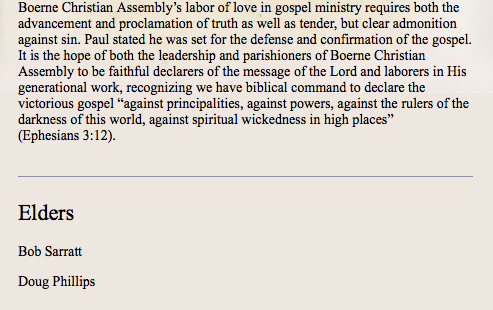 Is Doug Phillips still a teaching elder/pastor at his church, Boerne Christian Assembly? This was first question that came to my mind after the big news this week of Phillips stepping down. If this man, who taught others how to have godly families, how men should be godly husbands and fathers, had fallen into sin – – so much that he felt the need to resign his Vision Forum Ministry position as president, then what about the even more important ministry work – – that of shepherding of God’s flock? The question as to whether or not Phillips remains in his position as teaching elder is an important question as it helps people to be able to examine the validity of his statement of repentance. If families are looking to this man for godly teaching, yet he has recently been living a life contrary to what he is teaching, this is a problem of integrity and moral character. I’m uncomfortable posting an anonymous comment as fact. I need more than that. Well, yesterday, more credible information came in via Voddie Baucham’s Facebook page. If you recall, Baucham and Phillips are good buddies. They both follow the family-integrated church model, are into similar ideologies of Patriarchy, Homeschool Movement, courtship, etc. They speak together at conferences. 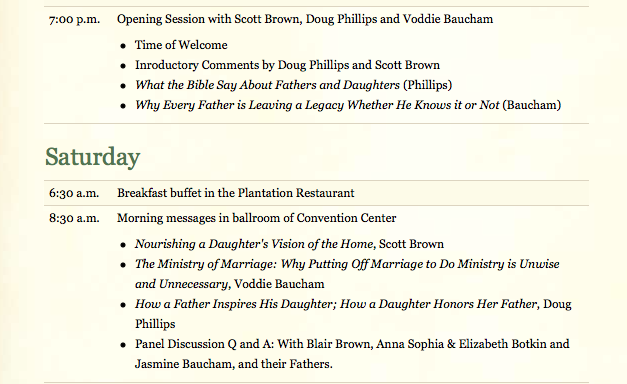 Here’s a snippet of screenshot from a father/daughter retreat in which both Phillips and Baucham spoke. Ok, so now that we have established that Baucham and Phillips have pretty close ties, I think Baucham is a pretty credible source when he says this on Facebook, not once, but twice – that Phillips has in fact stepped down as elder from his church. Take a look at this, however. 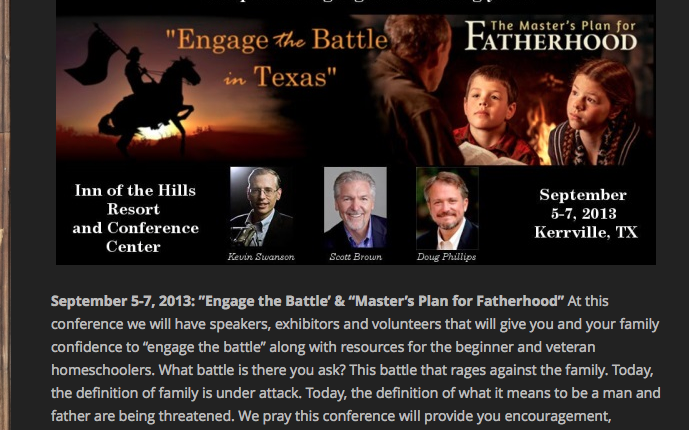 Phillips must have felt like his life was in order enough to speak at a conference put on by FORGE Ministries held less than two months ago: “Engage the Battle” and “Master’s Plan for Fatherhood,” which included familiar names, Kevin (Embedded-Fetuses) Swanson and Scott Brown. This female blogger has questions. What compelled Phillips to resign this week? Why didn’t he step down from the Vision Forum Ministries president position in February when he allegedly stepped down from his teaching-elder position? Why, if he felt the necessary to step down from his elder position, did he continue speaking on topics such as godly fathering, godly husbands when his own marriage and home life were going through their own battle? We talk about spiritual abuse here. We study false teachers. Many of us missed the warning signs in our own churches. So now, in order to prevent that from happening again, we study so as not to repeat the same mistakes. We watch Christian leaders use their positions of leadership inappropriately, say one thing, do another, etc. Some of us probably have trust issues. We want to see the fruit in a leader’s life, which is a Biblical response. We want to see true repentance before we can trust. What does true repentance look like? I typed a phrase for a Google search: “what does repentance look like?” and found a sermon entitled, “What Does True Repentance Look Like?” by none other than Scott Brown, Doug Phillips’ friend whom he recently spoke with at the fatherhood conference shown above. The date of the posting was February 28, 2013 (sermon was actually given April of 2011). I have no way of knowing if Brown knew of Phillips stepping down from his elder position around that time, or of any personal matter, but find the February timing strangely coincidental. How do you define repentance? Notice that John uses a verb metanoew (meta-no-eh’-o) which means to turn and change. In this sense, John has a turning ministry. And in many ways we have that same kind of ministry. Our job is to go out into the world to call for repentance – for turning, because repentance is turning. Most people are turning from either an intentional lifestyle of irreverent God hating wickedness or, religiosity and moral fakery. These are the two kinds of people that were actually out coming to John in the wilderness. True repentance is like an earthquake of the soul that changes the configuration of your life. And it is like the restructuring of the earth happens when the hills are brought down and the valleys are raised up. This is the radical restructuring of life that is true Christianity. So these are the earthquakes of the soul, that come from the pressure points that are building in people’s lives. At some point there is a breaking point, a metanoeo, a restructuring of life. These changes all come from the question, “What do I do with the things that God has given me?” The answer is, repent and let the landscape change. You may ask, “What do I do with my job?” Repent; let the landscape of your labors change. You may ask, “What do I do with my family?” Repent; let the landscape of your family change. You may ask, “What do I do with my church?” Repent; let the landscape of your church life change. Those are strong words. You can find Brown’s complete sermon on repentance here. Scott Brown does a good job describing repentance. A lot of people have been hurt by Phillips directly and indirectly. There are many personal accounts scattered throughout the internet. At some point you have to say either they are all bogus or there is a pattern. Well, now he has publicly confessed to an affair with a woman. Yes, I think we are looking for these signs of repentance from this very prominent and respected Christian leader. Should we not expect any less? Restitution: Those who experience godly sorrow and true repentance will desire to make restitution to the victim. There is a spiritual debt to God himself which they can never pay and which only the blood of Christ will satisfy. But there is a temporal debt to their fellow man which they must be willing to pay. It is not enough that they will cease and desist from the wrongdoing. They will do whatever is necessary to heal those they have injured by restoring to them what they have taken. Godly sorrow produces such compassion for the injured party that the penitent man aches to bring health and wholeness to those he has injured. Phillips’ public ministry and pastoral ministry has affected many lives. We are all hoping and praying that there is complete repentance, including restitution to those harmed. Next postDoug Phillips: Repentance and Restoration – Is it Possible? The whole mission of people like Doug Phillips seems more like Mormonism or old-school Roman Catholicism than Christianity. They are moralists and traditionalists, and they seek an old-fashioned existence that stresses man-made rules. It is the replacement of God’s message with religion.